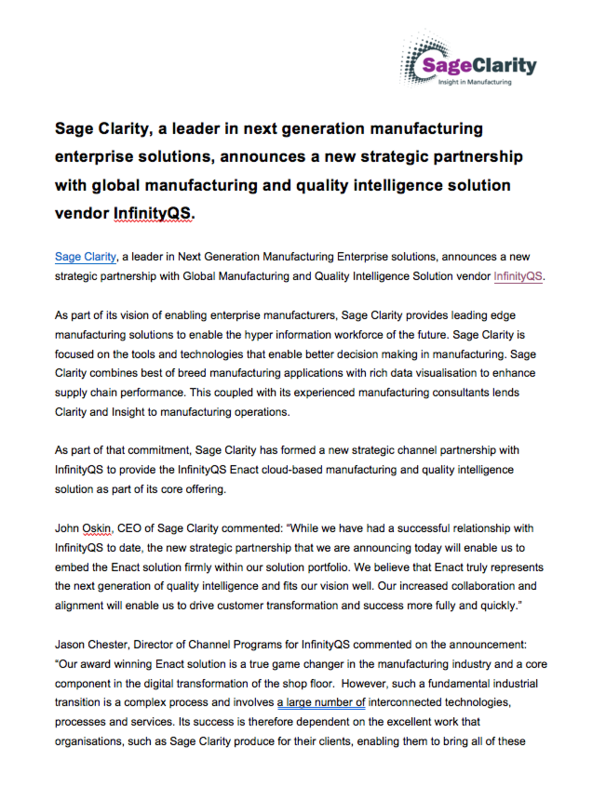 Sage Clarity, a leader in next generation manufacturing enterprise solutions, announces a new strategic partnership with global manufacturing and quality intelligence solution vendor InfinityQS. As part of that commitment, Sage Clarity has formed a new strategic channel partnership with InfinityQS to provide the InfinityQS Enact cloud-based manufacturing and quality intelligence solution as part of its core offering. 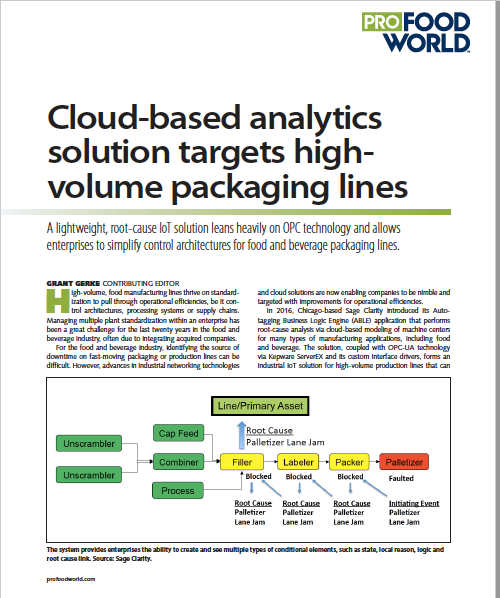 A lightweight, root-cause IoT solution leans heavily on OPC technology and allows enterprises to simplify control architectures for food and beverage packaging lines. Shallow-dive analytics is a new approach to managing the enormity of big data and the resulting information overload via a one-click, quick review of only the information that is most pertinent to business objectives. 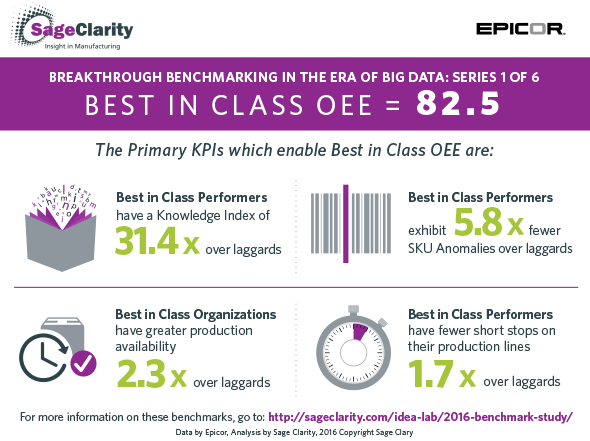 By focusing on key performance indicators (KPIs), proponents believe that the shallow-dive concept can enhance supply chain performance through better and less-time-consuming data management. 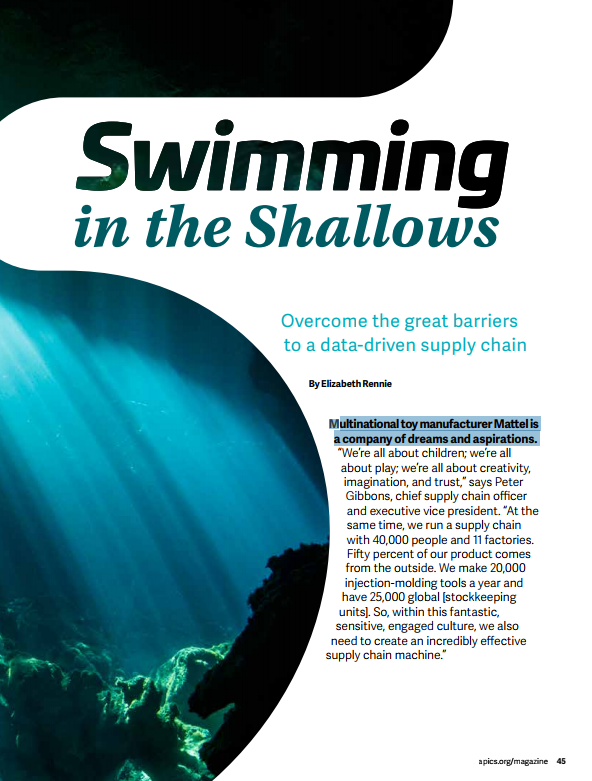 Read the full article to learn how Mattel uses Shallow-dive analytics to improve their supply chain performance. 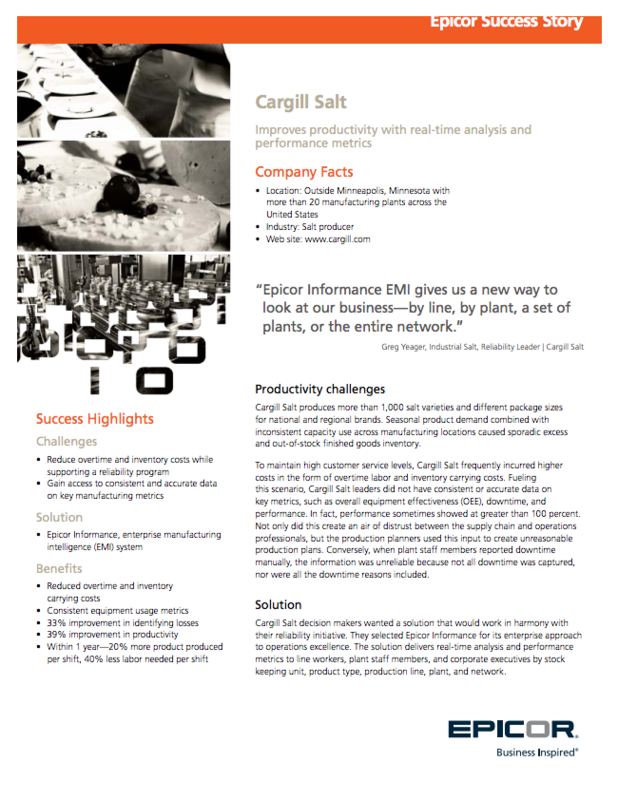 Cargill improves productivity with real-time analysis and manufacturing performance metrics. Cargill Salt produces more than 1,000 salt varieties and different package sizes for national and regional brands. Seasonal product demand combined with inconsistent capacity use across manufacturing locations caused sporadic excess and out-of-stock finished goods inventory. 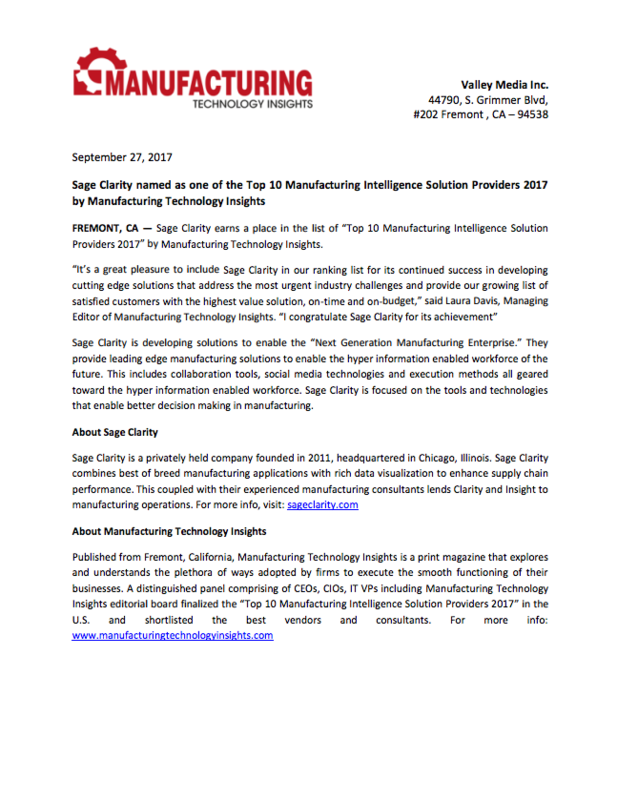 FREMONT, CA — Sage Clarity earns a place in the list of “Top 10 Manufacturing Intelligence Solution Providers 2017” by Manufacturing Technology Insights. 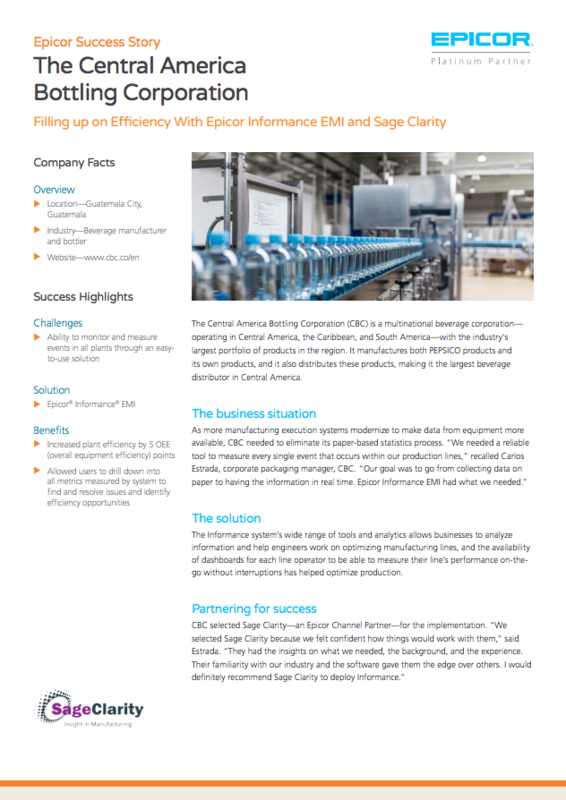 “It’s a great pleasure to include Sage Clarity in our ranking list for its continued success in developing cutting edge solutions that address the most urgent industry challenges and provide our growing list of satisfied customers with the highest value solution, on-time and on-budget,” said Laura Davis, Managing Editor of Manufacturing Technology Insights. High volume, food manufacturing lines thrive on standardization to pull through operational efficiencies, be it control architectures, processing systems or supply chains. Managing multiple plant standardization within an enterprise has been a great challenge for the last twenty years in the food and beverage industry, often due to integrating acquired companies. For the food and beverage industry, identifying the source of downtime on fast-moving packaging or production lines can be difficult. However, advances in industrial networking technologies and cloud solutions are now enabling companies to be nimble and targeted with improvements for operational efficiencies. 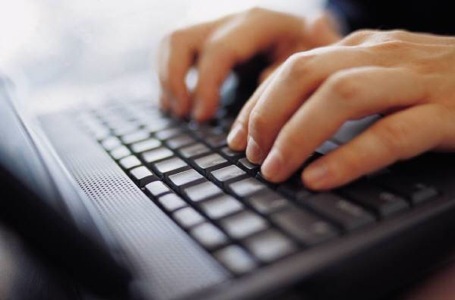 In 2016, Chicago-based Sage Clarity introduced its Auto-tagging Business Logic Engine (ABLE) application that performs root-cause analysis via cloud-based modeling of machine centers for many types of manufacturing applications, including food and beverage.